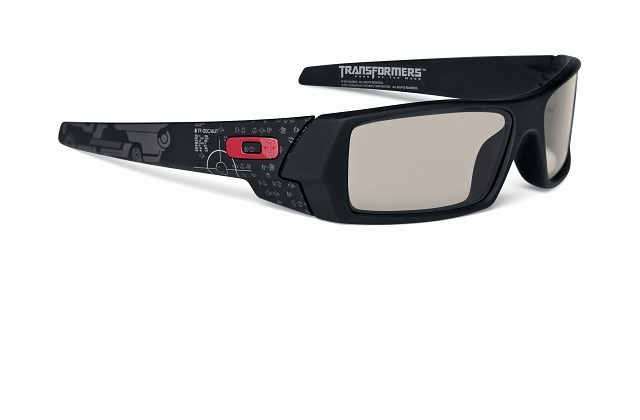 Oakley, Inc. today announced the upcoming release of limited edition 3D glasses with custom graphics that commemorate the debut of “Transformers: Dark of the Moon,” a much anticipated 3D feature film. Available today, the Oakley 3D Gascan® Transformers Limited Edition offers unparalleled performance to provide the ultimate 3D entertainment experience. “We are honored to team up with Paramount Pictures and Hasbro to offer this unique limited edition 3D eyewear,” said Oakley CEO Colin Baden. “This film will push the envelope of 3D entertainment. With all the technology and talent that went into its creation, it deserves nothing less than the world’s best 3D glasses, and the innovations of Oakley 3D Gascan represent the state of the art. Our goal was to set the standard for optical performance in 3D, and we achieved it. Customers lucky enough to get their hands on this limited edition will have a rare collectible to commemorate a mind-blowing cinematic experience,” Baden concluded. “We are thrilled to have Oakley develop this product collaboration with Hasbro to bring even more excitement to audiences anticipating seeing this incredible first-ever Transformers film in 3D. The glasses are amazing!” said LeeAnne Stables, Paramount Pictures’ EVP, Worldwide Marketing Partnerships. This special edition of Oakley 3D glasses carries graphics inspired by the movie, which will debut in the U.S. on June 29th. One side of the frame is highlighted by the AUTOBOT SHIELD icon while the other carries the emblem of the DECEPTICON shield icon. Enriched with more film-inspired art, a custom Microclear™ bag is included for lens cleaning and frame storage. Oakley 3D Gascan is the world’s first 3D eyewear that is “optically correct,” a term that does not refer to prescription correction. Conventional non-prescription lenses can distort vision but Oakley HDO™ 3D technology takes advantage of the company’s decades of optical innovation to maximize vision with clarity and fidelity while providing truer alignment of 3D images. The lens curvature gives the wearer a wide field of view while virtually eliminating glare and reflections. Oakley 3D lenses offer an uncompromising degree of color fidelity, allowing the wearer to see what the director had in mind for every shot. Made of comfortably lightweight O Matter®, the frame optimizes comfort with a precise Three-Point Fit. Oakley 3D glasses have earned official certification by RealD®, the world’s most widely used 3D movie technology. In addition to maximizing the 3D cinema experience, Oakley is pursuing partnerships with manufacturers of home 3D systems that utilize passive polarization technology. This will allow consumers to use the same glasses for 3D entertainment in the home and the cinema. To showcase the special edition release, select Oakley Stores will feature a 3D interactive experience with displays showing trailers from the new film. These retail locations include Oakley Stores in New York’s Times Square and SoHo, the Hollywood store, and the Market Street store in San Francisco. The product will also be available at other Oakley Stores as well as Oakley.com, Amazon.com, and Sunglasshut.com websites.